Last week was a really busy week as we prepared to go to Little Rock for the wedding. I did sneak in a little card making time. This was made with left over scraps from another card using Basic Grey's Offbeat collection. I made it for Kristina Werner's 5 Things on My Desk challenge and uploaded it to Two Peas. 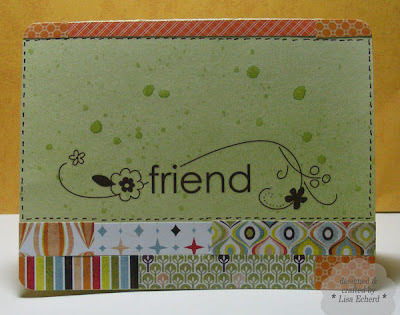 DSP: Offbeat by Basic Grey and some Sweet Pea by Stampin' Up! One project note: I applied the rub-on before using the Tattered Angels mist. I've found that rub-ons don't adhere well over areas you have just inked so I figured the spray might be the same way. Can you believe the week is nearly half gone? Better get back to work. Thanks for stopping by! enjoyed reading your blog today Lisa-it's just so nice to find out things about people whose blogs you visit-I like the card you posted-don't you just love basicgrey paper?